We are back in Alto right now. I've been working a few days at my schools. Right now I'm working at four different middle schools. Hopkins, Byron Center and two in Caledonia. As I did last year, I'm working with teachers investigating ways to increase their students' achievement in reading and writing. But until school gets going in full swing, I'm doing lots of fun things. When we were up at the cabin two weeks ago, we attended the Boys and Girls Club Ping Pong Tournament with Mom and Dad. Since returning to the cabin our days have been fun. Some have been busy and some are simply relaxing. Thursday we took my mother and dad out to celebrate my dad's 82nd birthday. They are always a fun time. Yesterday was our time to work in the yard between the rain storms. One benefit of working in the yard of the cabin is that you have a great view while working. Here I took a short break to watch the Paul R. Tregurtha, a 1,000 footer, pass down the river. You can also see how well my flowers are doing in spite of the little care I give them. Last night we went to the Bay Mills Boys and Girls Club to attend the Ping Pong Tournament. We didn't play but sponsored some friends in this fundraising event. My sister's EUP Learning Center has put a reading lab there and this event was to raise funds for that. Susie & Roger both won their first round and ended up playing each other. That was fun because Susie is highly competitive and she hated eventually losing to Roger. We traveled back to the cabin on Monday. We passed through a pretty heavy thunderstorm just south of the Mackinac Bridge. The sky was clearing up as we drove over the Bridge and I took this photo of the sunset. When I looked to the east I saw a beautiful rainbow over Mackinac Island. Yesterday we drove to Escanaba for the UP State Fair. Our good friends, the Bells, were showing their draft horses and we watched the various events all day. Plus we had time to explore the fair and eat some of the best fair food I have ever had. This is Owen Bell, Arlen and Lovada's son, driving in the cart class. This Belgium horse did very well. The Bells who were showing yesterday were Arlen & his brothers Don & Bob. Several of their children and grandchildren also took part. In this competition, there were 5 Bells in the ring at one time. I had a blood test this week and I was happy with the results. Let me tell you the whole story. I have always had high cholesterol. It 'runs' in my family. I've been taking Lipitor for several years and that always has controlled it well. Until this year, that is. In my annual blood test this spring, the numbers had skyrocketed and the doctor wanted to increase my Lipitor dosage. I asked Dr. Davis to give me three months to try and bring it down with diet. And she agreed. I was already eating what I thought was a healthy diet. I tried to be low fat and watched my portions but I needed something new. I went to Schuler's Book Store in Grand Rapids and starting looking through their food and diet sections. 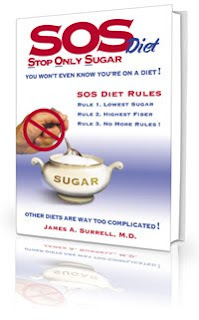 I came across a book called SOS Diet and it caught my attention.